Perfect for nature lovers, Koh Mook owns a great spot for swimming and diving to see beautiful corals found around the island. The island is also home to a fisherman’s village on the east side. But the real highlight lies within. Hidden inside is a lagoon featuring emerald-like color of water. When the tide is low enough, the entrance to the lagoon is then unveiled. You need to swim into a narrow tunnel for around 80 meters until you reach the lagoon. 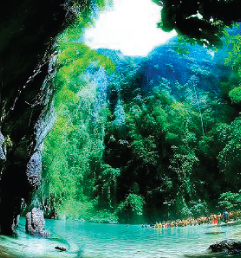 When the sun shines, the emerald color of the water reflects onto the tunnel’s wall, and that’s where its name, Tham MoraKot (The Emerald Cave) came from. To get to the island, take the boat from Pak Meng Pier in Amphoe Sikao for the 40 minute trip. The boat rental fee is about 1,500 Baht per day. Choices of accommodations are available on the other side of the island. Proclaimed a National Park on October 14 1982, Hat Chao Mai is a 20-kilometer coastline featuring a 5-kilometer beach with pure sands in a shady limestone hill setting with caves where prehistoric human remains were found. Land-based attractions include Pak Meng Beach, Chang Lang Beach, San Beach, Yao Beach, Yong Ling Beach, Chao Mai Beach and Chao Mai Cave, all of which are accessible by car. As for the park itself, endangered dugong, rare black-necked stork, wild pigs, pangolins and languors can be spotted. 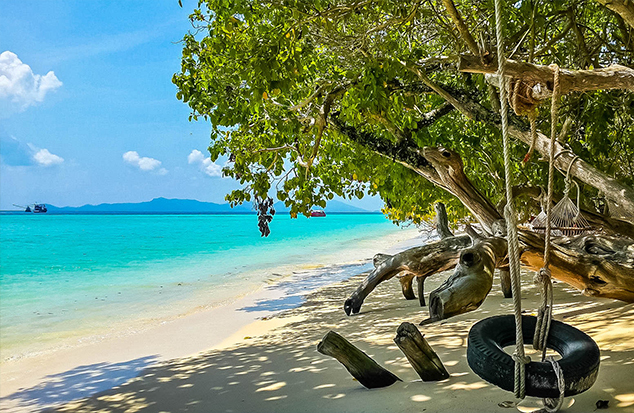 The park is also responsible for 7 other islands including Koh Muk, Koh Kradan, Koh Chueak, Koh Pling, Koh Waen, Koh Meng and Koh Chao Mai. Accomodations are available on the island. Those who don’t stop at the cave are considered those who don’t make it to Trang. The natural cave is located in Amphoe Huay Yod, Trang. It is acclaimed to be on of the Unseen Thailand’s most amazing places. Rivers flow through this natural wonder surrounded by mountains inside which there are magnificent stalactites welcoming your unrivaled opportunity for boating. Splendid phenomena await your visit with its beauty. For example, Chao Sao Cave possesses stalactites resembling a large curtain in front of the cave and owns a stone altar like a bed. 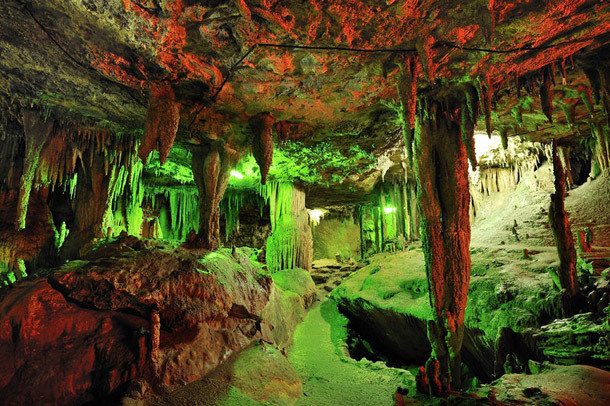 Kon Tan Cave possesses stalactites which sound melodious like a bell when knocked at. Rak Sai Cave has a long lane for walking on which large roots of banyan trees stretch along for 4 kilometers. Another exciting and impressive thing not to miss is Lod Cave in which you have to lie down on the boat and go through the lowest ceiling of the cave. Passing through this cave is like passing through a dragon. The government provides boating services to admire the beauty of the cave, which is considered as a way to promote eco-tourism. The service charge is 300 baht per 5 people and a trip lasts about 45 minutes. 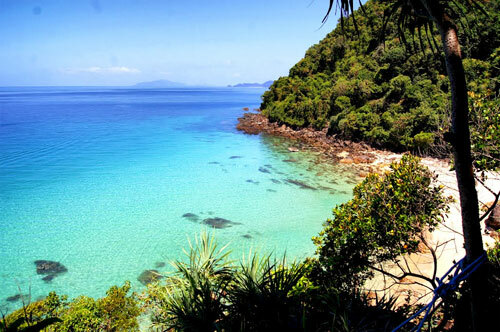 Among the collection of islands, Koh Kradan is probably the best-known and the most beautiful island in Trang. It is blessed with large, powdery white beaches, emerald-colored water and shallow-water corals. Very few accommodation options means this is ideal for a peaceful, offbeat break.